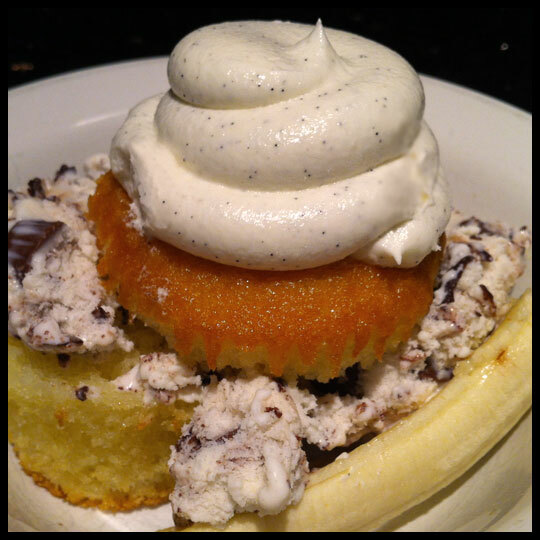 This entry was posted in Cupcakes and tagged Banana Split, carrot cake, cupcakes, Give & Go, Kimberley's Bakeshoppe, lemon, nut, pumpkin spice, Red Velvet, Triple Chocolate, vanilla by Crusader Jenn. Bookmark the permalink. Told you they are awesome!!!! Melinda, thanks for reading and responding! You tried the triple chocolate, right? Have you been able to try any others? They are all so good! I absolutely LOVE LOVE LOVE their cupcakes!!!! So moist & flavorful!! 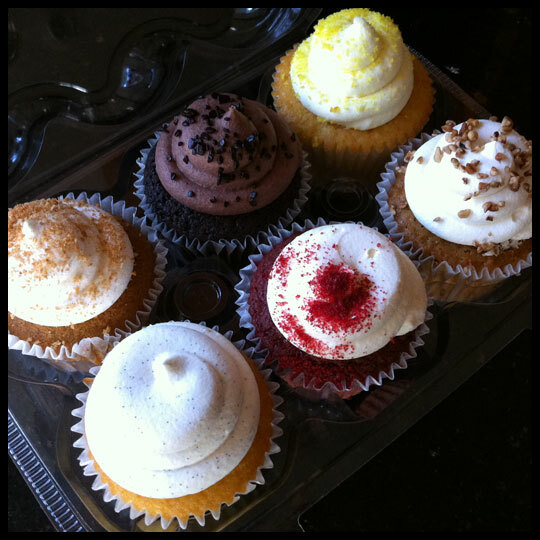 It’s been so hard to find cupcakes that tastes so good!! =) Keep up the yummy goodness! I’ve finally found my favorite ever cupcake!! I just loooooove the flavor of these cupcakes. I picked them at a local grocer – Fresh Greens. I’m a sucker for great tasting food. 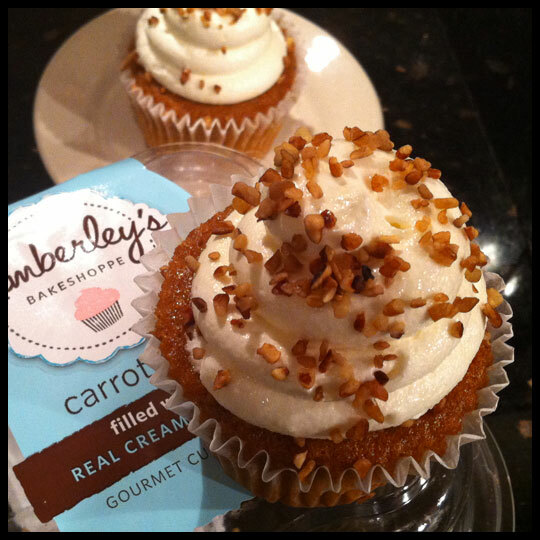 And because the cupcake is so moist – this is at the top of my list as most other cupcake brands lack moistness. Thanks for your post as I too was searching for a website & came across this. I use to live in Florida and have friend these amazing cupcakes! 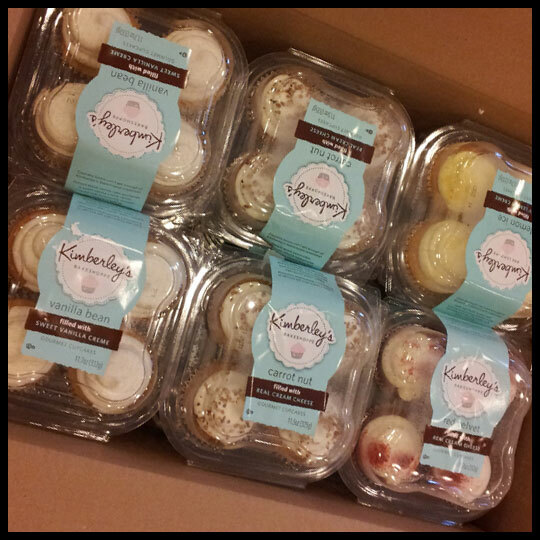 Just recentl I moved to NJ and went to my local Pathmark to find Two Forks Bakery cupcakes Vanilla Creme…it tasted just like Kimberly’s Bakeshoppe cupcakes. I was completely surprised and happy!! I LOVE these cupcakes. I get that at Kroger for $4.99 for a pack of four. They’re delicious. So far, I have tried the red velvet (divine!!) and the vanilla bean (loved it as well). The frosting is so, so smooth and creamy, and not overly sweet like so many grocery store frostings. The cakes are moist, soft, and perfect. I am buying the triple chocolate next! It looks so good. The only thing “bad” about these cupcakes is the filling – I simply don’t like a filling in my cupcake (maybe I’m an odd ball). There’s plenty of icing on top the cupcake, not really need for more inside… it becomes overwhelming; a bad icing to cake ratio! I take a bite and then I scoop out the filling inside (especially on the vanilla bean where the filling is actually quite different from the icing.. reminds me of a donut filling..it’s rather gross.). I’ve just recently moved to Maui and discovered it at a local grocery store – agree with everyone that these are delicious! Less than a week and I was back for my second pack (Lemon Ice). So hard to find good bakeries with homemade goodies so these moist cupcakes are a hit! I stumbled upon this article when I decided to find out more about them after seeing the note on the packet that it was from Canada! Didn’t want to be indulging in cupcakes filled with preservatives that has traveled thousands of miles to my home!! Am happy to see that they are frozen fresh and thawed at the grocer. Thank you! Best cupcakes ever!! 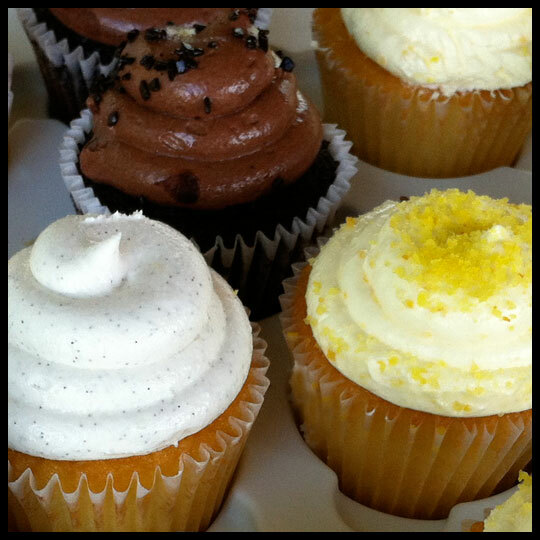 Even better than the formet cupcake shop we have in town that are $4.50 per cupcake!!! I work at a Kroger in Nashville, Tennessee and we’ve been carrying these cupcakes. We recently got in a new flavor that I haven’t seen anyone comment about. It’s vanilla cake with strawberry and vanilla crem swirl icing on top and filled with strawberry (it’s almost like preserves) It is SSOOO good. We sell them for $4.99/four pack but I got them on markdown for $1.99. I hope this flavor is available where you are they are very delicious. OMG, the next best thing from Canada, beside Coffe Crisp chocolate bars, love them, Triple Chocolate is my favorite. Kudos to Kimberly’s! My girlfriend brought these to my b’day dinner. I don’t usually like store bought cup cakes so I was skeptical. But these are absolutely amazing!!!! I brought some in for my co -workers to try the next Friday and we are all addicted to them in the worst way! Lemon is good but strawberry is my fav so far. I cant wait to try them all! Oh my god! These are the best cupcakes ever! I’m dying to find them in my town! Does anyone know where to get them in Staten Island, New York? Or in central/east New Jersey? I tried it for the first time on a recent trip to canada. 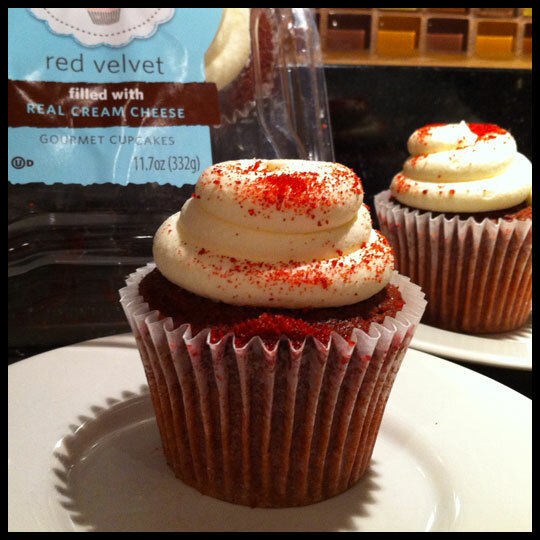 The red velvet, it was divine! I wish these cupcakes were more widely available. They have a website now. Not alot of info but it’s a start. Thanks Ann! I’m glad they finally gave them a dedicated website! If you contact them (or Give and Go, the manufacturer) they might be about to provide you with some local retailers who carry them. Good Luck! My coworker and I were looking for a cake for another coworker’s birthday and found these cupcakes. I have to say, we were both shocked to find out they are delicious and that Walmart carriers them. If I wouldn’t of gone to buy them, I would have sworn they were from a local bakery. The price is inexpensive for the great product you receive. We bought chocolate and strawberry, they were both amazing. I still want to try the red velvet. I know where I’ll be getting more cupcakes from. I love these cupcakes! I purchased them at a local Walmart in Nj where I live. But, they don’t carry the triple chocolate anymore…i’m very upset. I can’t find any stores that carry this brand. I looked on their website and it didn’t list any locations. Does any one else know where I can buy them? I am still religiously eating these whenever I can find them. The Triple Chocolate and Lemon Ice are staples in my house and yes, they freeze SO well that when I do defrost a package, you’d never know they weren’t fresh when you eat them. At under a $1 per cupcake, these are decadent enough to fool anyone into believing they’re not from Walmart or Walgreens, which are the only two places in my area that carry them. I can’t wait to try the new flavors they’re going to release. 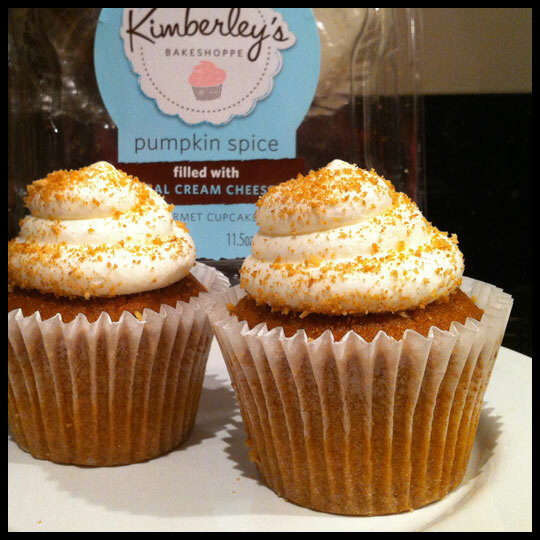 I love Kimberley’s gourmet cupcakes they are delicious. I only tried Lemon ice and I just can’t stay away. I will eventually talk myself into trying the other flavors. Hi do these HAVE TO be refrigerated? I don’t like them cold because the frosting is hard, but if I let them sit out a few hours then the frosting becomes soft and creamy which I LOVE! So do they HAVE to remain refrigerated or not?